In this article, we will discuss how we can create a HelloWorld App using Asp.Net Core 1.1 and Visual Studio 2017 in Windows. In this article, we will discuss how we can create a HelloWorld app using ASP.NET Core 1.1 and Visual Studio 2017 in Windows. We will learn how to create an ASP.NET Core Web application project, how to add new Controller, how to add new View, and how to run the HelloWorld app etc. Open Visual Studio 2017. Go to File menu, point to new and click New project. The "New Project" window will open. 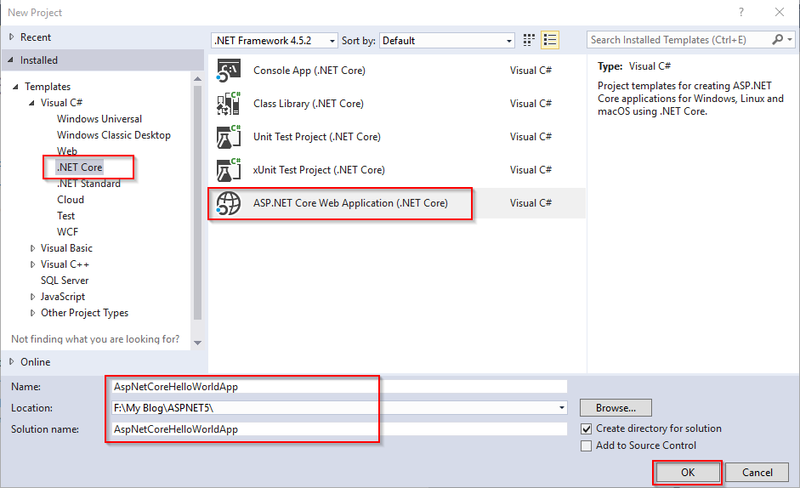 You can select an installed template like “.NET Core” in Visual C# Template and then select the Asp.Net Core Web Application (.NET Core). Type tghe project namem, such as - AspNetCoreHelloWorldApp. Choose the project location path and click OK button. 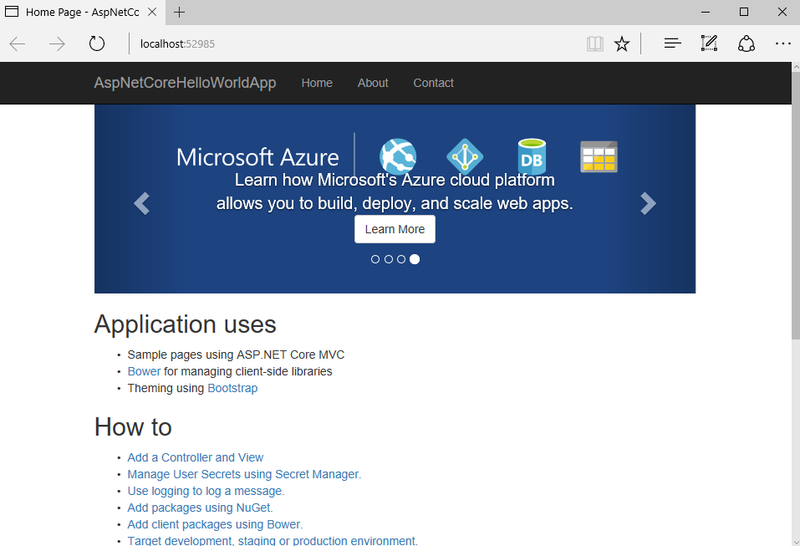 The New ASP.NET Core Web Application (.NET Core) - AspNetCoreHelloWorldApp window will open. Select ASP.NET Core version 1.1 in the dropdown box. 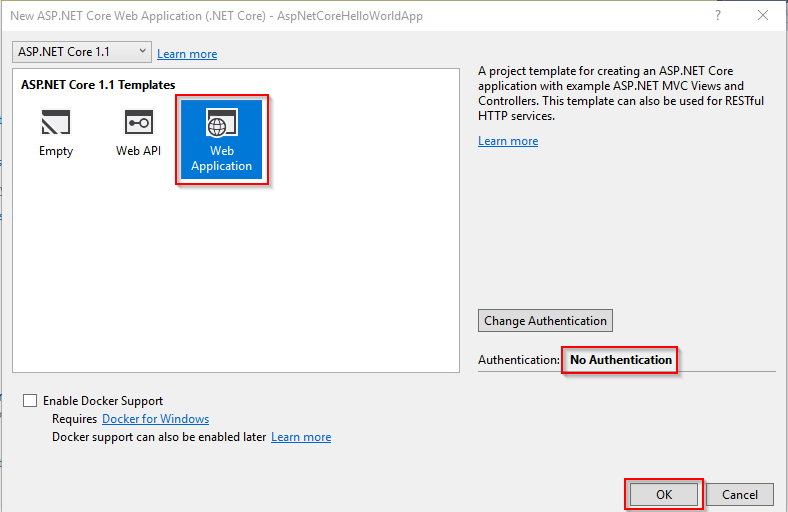 Select a template as Web Application and keep the default No Authentication. Then, click the OK button. 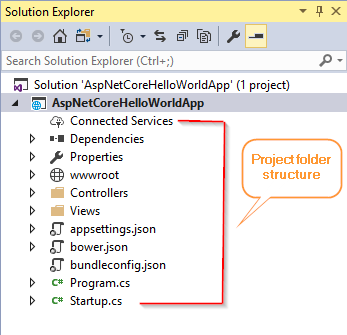 Now, you can see AspNetCoreHelloWorldApp project structure, as shown in the screenshot given below. Now, we can run the app with/ without debug mode. If you want to run the app in debug mode, pressing the F5 button will do the trick. 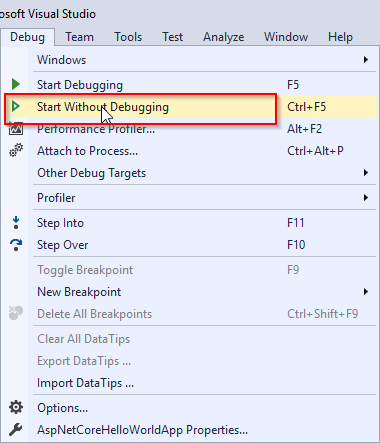 Otherwise, you can go to debug menu item in Visual Studio. Then, click the "Start Debugging" sub menu item. Now, you have successfully launched the app in the browser. If you want to run the app in non-debug mode, pressing Ctrl+F5 button will run the app in non-debug mode. 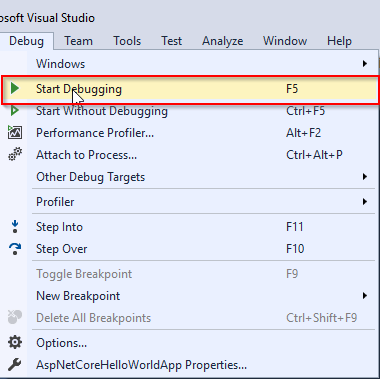 Or, you can go to the debug menu item in Visual Studio. Then, click the "Start Without Debugging" sub menu item. 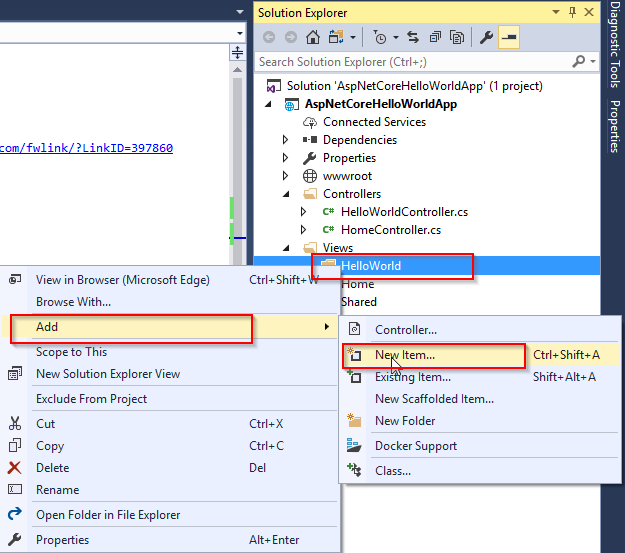 In Solution Explorer, go to the Controllers folder, right click it and point to Add, followed by clicking the New Item. 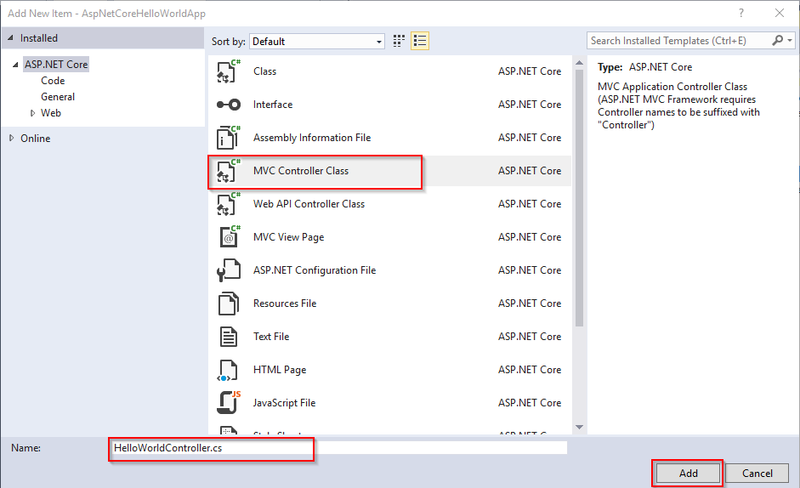 You can select an MVC Controller class and type the class name as HelloWorldController. Then, click the Add button. Copy and paste the below code in HelloWorldController.cs. Now, you can change the Controller name as shown in the below screenshot. 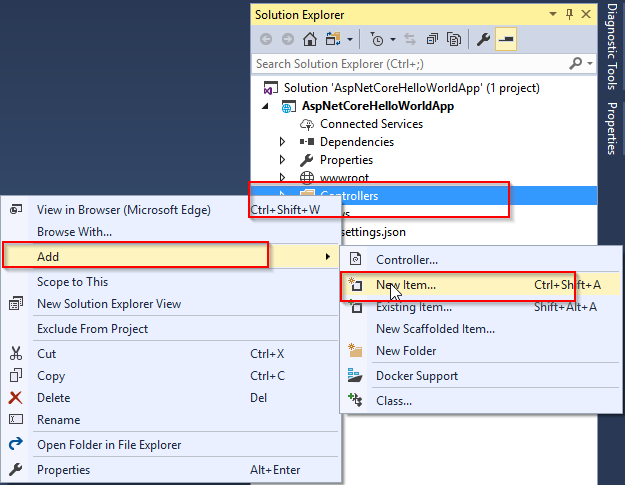 In Solution Explorer, go to the Views folder, right-click it and point to Add, followed by clicking the New Folder. Then, name the folder as HelloWorld. Again, in Views folder, go to the HelloWorld folder, right-click it and point to Add, followed by clicking the New Item. 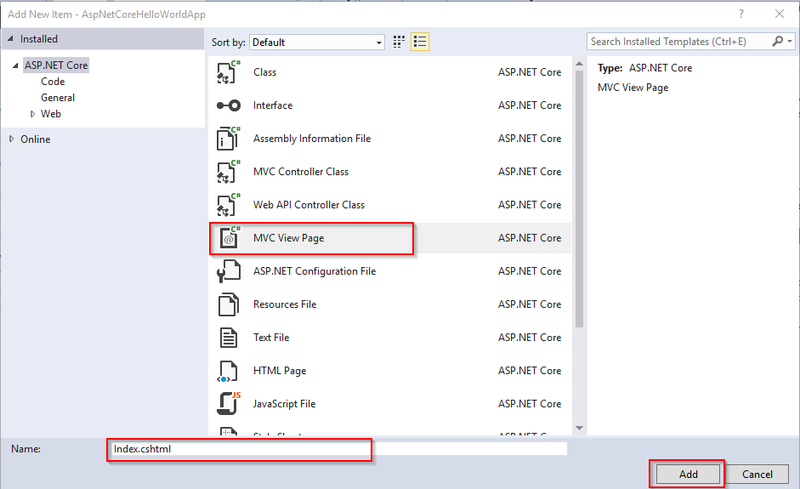 Select an MVC View page, type file name as Index, and click Add button. 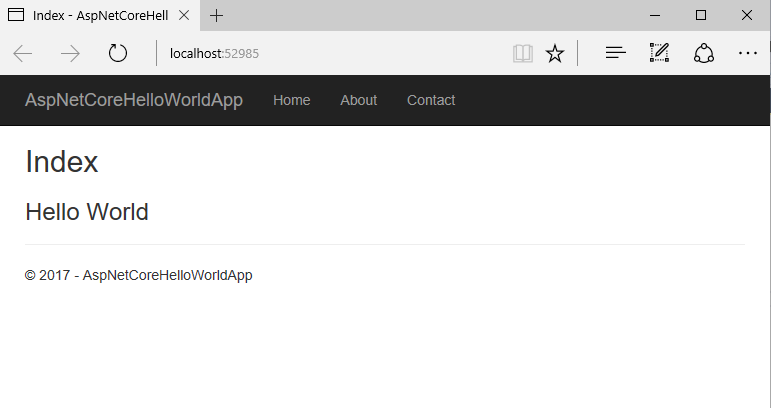 I hope you understand now how to create a HelloWorld App using ASP.Net Core 1.1 and Visual Studio 2017, how to add new Controller, how to add the new view and how to run the HellowWorld app. I have covered all the required things. If you find anything missing, please let me know. Please share your valuable feedback or comments to improve my future articles.